Something tells us you're in search for the finest hardscape design for your home. Whichever it may be, we're here to help you do it RIGHT and the best part is... we provide FREE estimates on every project! We're at (317) 344-8024, don't hesitate to reach out with any questions and to schedule your FREE estimate. If you have ever been to a ‘Home-A-Rama’ show, an “Open House” or if you have even driven through brand new development in your area, you have probably seen some of the finest and most beautiful landscaping and custom outdoor living spaces around today. Many newly constructed homes are being built with the backyard look in mind. The use of an outside living space brings the indoors – outside – and can be an asset when a home goes on the market. Most people do not really think about it, at first, but when you sit down and consider all the possibilities of which you can do to make your outdoor living area unique and relaxing, the sky is pretty much the limit! What's a complete list of things your do? In terms of hardscaping, we do it all. 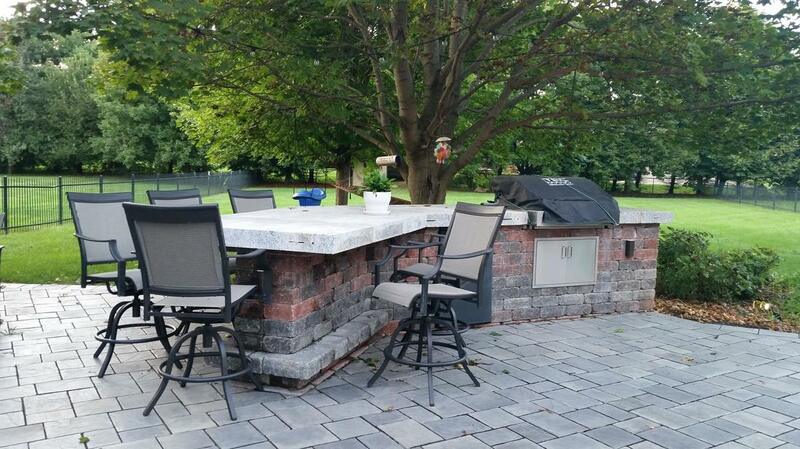 Most of our projects consist of hardscape work, outdoor kitchens and pavers. Most common are installation, construction, design, consultation & cost estimation. What do you offer for backyard water features? We have a variety of different things we do. Most popular ones are aquascapes, waterfalls, ponds and outdoor water fountains. In terms of services, it's generally installation. Many people also like Koi Ponds which we are very skilled with. All of the Marion County, to include Indianapolis, IN as well as: Carmel, Fishers, Noblesville, Anderson, Greenwood, Avon, Plainfield, Lawrence, Westfield, Zionville, Brownsburg, Franklin and Greenfield. What do I get at a FREE estimate? First off, we set up a time for a walk through of your project. Next, we'll go over designs, ideas, materials, prices and options. Then you will receive our contact information together with the total project estimate. We make it simple for you, because your satisfaction is our ultimate goal! One of the most common types of landscaping is the use of hardscapes throughout the outdoor design. It does not matter if you live in Indianapolis, Carmel, Fishers or even Greenwood! The ideas that designers bring forth today incorporate some of the most breathtaking designs, which can really add to the actual square footage of living space to your home. What comes to mind when you think of a hardscape? Hardscaping can be any variety of things. It can be anything from an outdoor fire pit to even a beautiful grotto in your backyard. Hardscape designs are also a great way to add to the overall look of your home by increasing the size of flower bed walls, creating winding sidewalks or grand entryways into driveways and even neighborhood entrance signs. 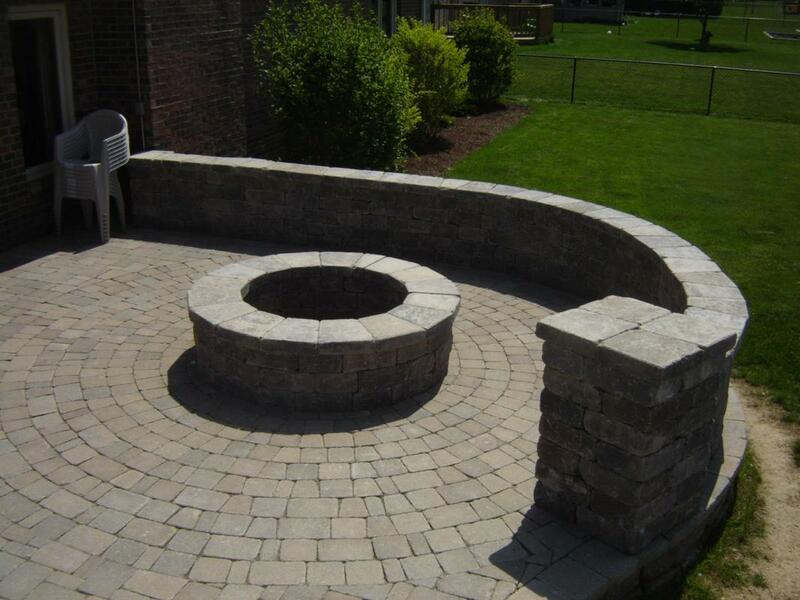 Fire pits are a very popular form of a hardscape. They are easy to construct and require very little maintenance once they are built. 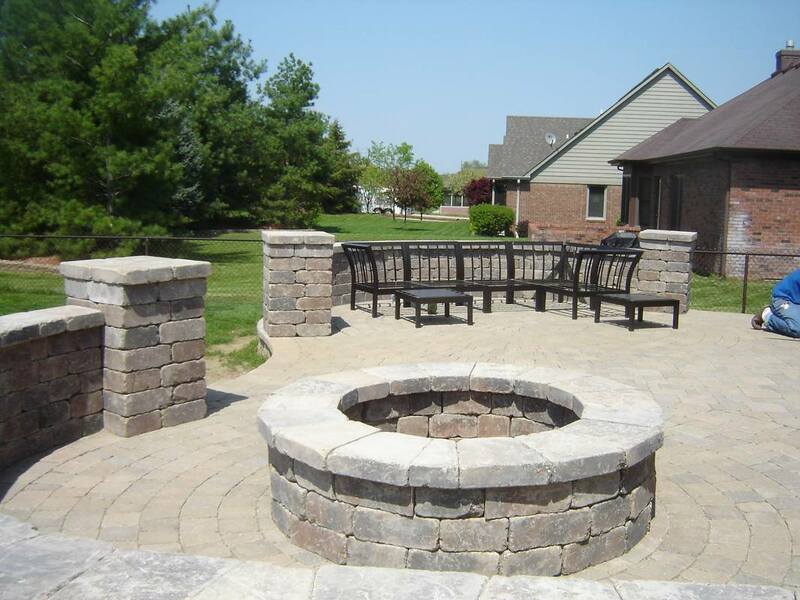 Retaining walls can also be built up around fire pits to create seating and give the outdoor fire pit area a finished look. ​Homemade fire pits are a great way to visit with guests or enjoy a nice “campfire meal” in your own backyard. They can be enjoyed any time of the year and when you design the fire pit yourself, it means that much more to you - because YOU created it. Outdoor Kitchens have become increasingly popular over the years and are a much sought after addition to any new construction. When putting a home on the market, the addition of an outdoor kitchen increases value and allows would-be buyers to really see themselves living in your home and entertaining their home guests in that very kitchen. Outside kitchens can have anything in them from a simple built-in grill, to the more elaborate designs, which include working burners, a built-in BBQ grate, ovens, a full bar and even running water. These spaces are excellent for outdoor parties and can help give you a more open space to entertain your guests as you prepare a home-cooked meal. 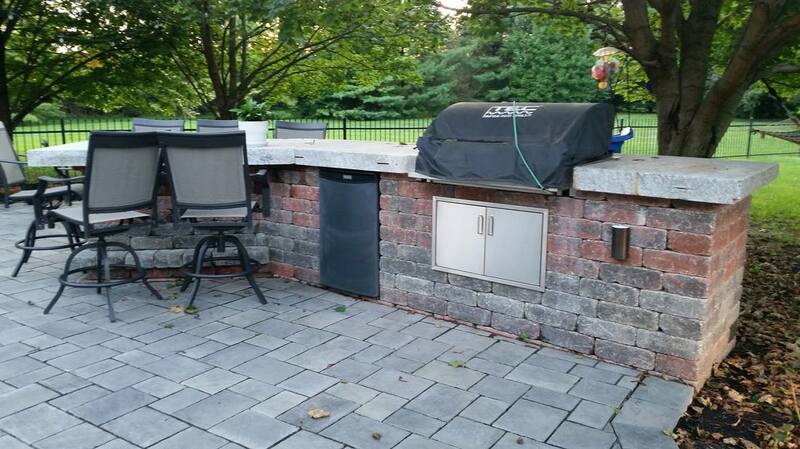 Some outdoor kitchens are designed and created by the homeowners to cut down on costs, while others are custom designed and built by licensed and bonded contractors. Sometimes a contractor may come in with a variety of design choices for you to choose from, which gives you – the homeowner - more options to incorporate into the design, some of which you may night have thought of. When working with outdoor designs, you will use a lot of stone and granite. The addition of granite countertops to these spaces brings that indoor kitchen feel outside and fully brings the design full circle. Granite, in combination, with the outside stone can add dimension and texture to the overall design. The use of varying color choices in your selection of stone and granite can also add depth. Other outdoor spaces might not be as elaborate as a full kitchens, but they might take on a more relaxing feel to them. Some designs are built up with fully functional outdoor fireplaces that are completely encased in stone and include a working chimney. Other fireplaces may have a glass encased firebox, which allows the flames to be seen from both sides of the chimney. When an outdoor living space is created with design choices like this, the spaces often resemble more of a ‘living room’ than a simple patio design. The furniture may be more relaxing and plush than simple outdoor lawn furniture, resembling comfortable INDOOR living room furniture and the space might even be decorated as if the design was created indoors. Design choices that include wall hangings, plants and table accent pieces may give you the feeling that you are in an indoor living space until you looked up to see the sky above you. Many TV design shows are famous for showing you top of the line living spaces just like these, that are created using these very design ideas and style techniques. With a little hard work and some ingenuity, you can create an outdoor living space that will be the envy of your friends and neighbors. Waterscapes are excellent additions to any home's landscape and can add a level of serenity to the back yard. Koi ponds are especially popular with many people who choose to add a pond as part of the outside landscape design. You can purchase Koi fish at your local pet store, and they are relatively easy to care for. The addition of waterfall features makes a great option to add to an outdoor pond design. There are a variety of stones that can be used to create the design, depending on the look you are going for. With so many stone choices and colors, you can create hardscape ponds that match the color of your home. The use of water garden features is a great way to add sound to your backyard getaway, too. If you have a pool you can purchase or build additional materials to help regulate the flow of the pool water, as well as give you the serene sound of running water. More elaborate design choices might include the use of plants and shrubs to complement your landscape design. The use of water features is a fantastic choice for masking surrounding noises near your home, such as traffic, or if you live in areas where the sounds of nature seem far away. Backyard ponds offer one of the most creative and lenient forms of hardscapes you can add to your home. You can start out with an area of your yard that naturally seems to collect water or gets soaked during rainstorms and turn it from an eyesore in your yard to something that you can relax by. When you start with a natural collection site, you have no set “blueprint” that you need to follow to create it or are bound to a plastic pond insert, but rather you have more of a creative license to design it how you see fit. In nearly every one of hardscape design ideas, the common denominator is the use of pavers. Whether you are creating a deck, pond or laying an entire patio, the use of pavers creates a very clean look that can last for many years. 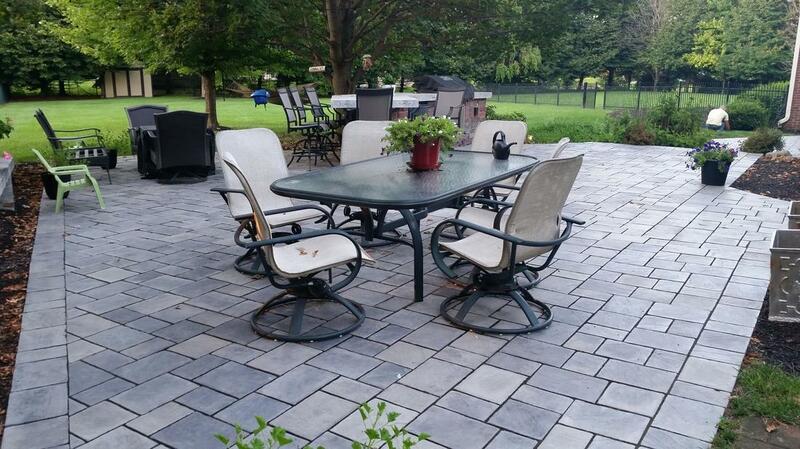 Pavers require little maintenance, other than an occasional power washing, and they are affordable and accessible, whereas you can find them at just about any hardware or “big box” store. They are available in a variety of colors, sizes and shapes. Depending on the look you are going for, you can choose rounded or more squared paver stones to create beauty around trees, your home or to create a completely new design. 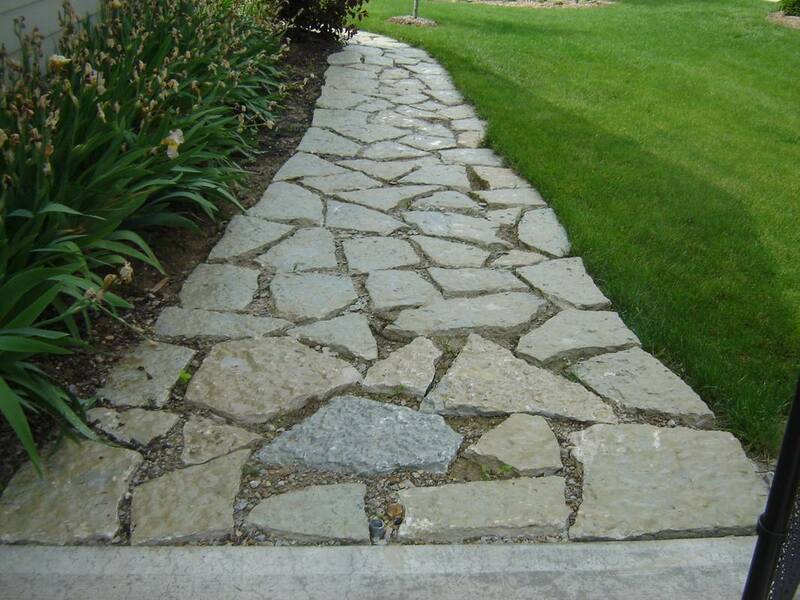 When you are using pavers to create walkways and sidewalks, the stone itself should be flat and ‘toe-stubbing’ free. The last thing you would want is to have a beautifully laid work and find a jagged edge in the middle of the landscape. 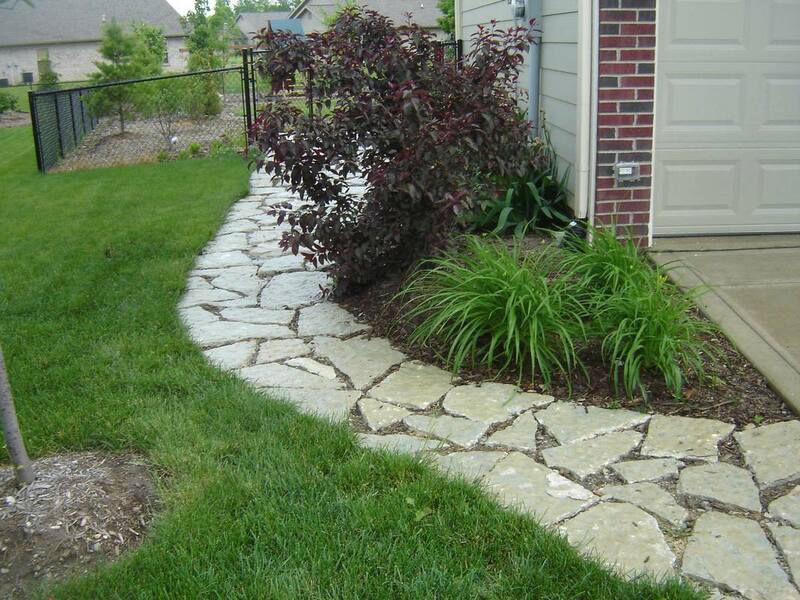 Hardscapes are excellent for when you want to lay a path in a well-landscaped yard. The use of pavers can give you a manicured look to your landscaping design. For example, round paver rocks can be set in a yard at distances apart, like stepping stones, or you can set them side by side, like bricking, to create one long, continuous path. 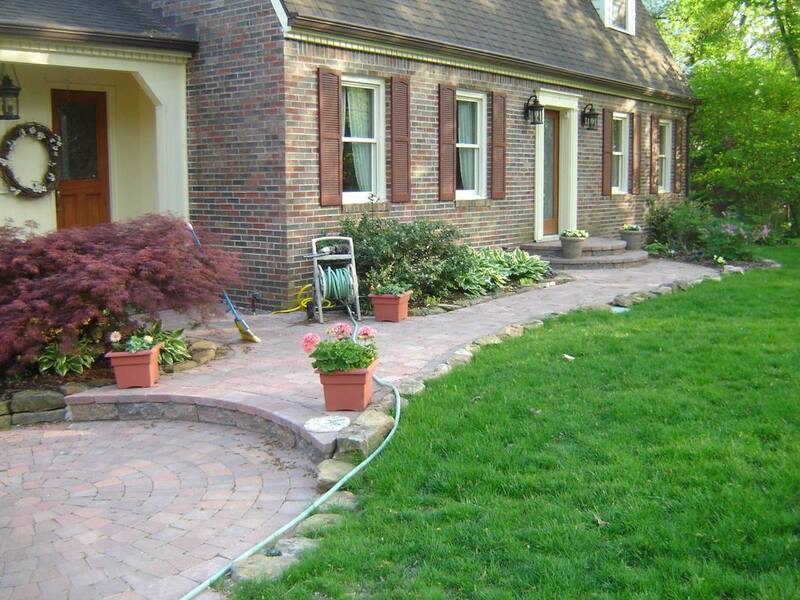 Another excellent hardscape design idea is using pavers to create a finished driveway. When you create a driveway or a walkway, you want to be sure that you level your ground beneath the pavers and set down grating, to help the hardscape from sinking into the soil. One of the most common mistakes when working with masonry and hardscapes in a DIY situation is improper setting. Nothing would feel worse than spending the money to create your beautiful landscape, to find it become unlevel or slowly start to separate, because you did not prepare the ground beneath the heavy pavers first. When in doubt, consult a professional or search out the DIY project online to see what other people have encountered, to help you learn what NOT to do, and learn from their mistakes. Sometimes you can find excellent suggestions and creative ideas for enhancing your project, as well!